If I blogged each week solely about a Top 500 albums of all-time list, we’d all be amazed how many albums we’ve never heard of or have totally forgotten about. Today’s band hit it big in the early 2000’s with an album that shows up on my lists— but most casual music fans don’t even know it exists. Growing up in Mesa, Arizona, Jim Adkins and Zach Lind had been friends since preschool. In 1993 the duo joined up with a couple other buddies and formed a band. Looking for a punk rock sound, they released a demo, followed up by an EP record in 1994. They were able to put out their debut record in short order via a very small label. The band’s name was questioned by that label, but the lead guitarist explained he had two little brothers who’d fight all the time. One younger brother drew a picture of himself shoving the entire Earth into the other’s mouth with the caption of “jimmy eat world”— the phrasing created such laughter within the group, that’s the name they went with. While their early stuff wasn’t super successful, they were incredibly devoted. Constant touring and collaborating with like-minded bands combined with constant tweaking of their sound, it led to them getting signed by Capitol Records in 1996. Backed by a major label, the band seemed poised for a breakout. Two albums into their Capitol tenure, sales were slow and they were dropped. Choosing to support themselves for a while, the band took day jobs and kept grinding. Jimmy Eat World eventually turned to DreamWorks and finally caught the big break with the release of Bleed American in July of 2001. Working with a new producer, the music was much more radio friendly than past albums resulting in four Billboard singles. “The Middle” reached number one and supported the album which has sold nearly three million worldwide to date. Critics praised the band’s usual experimentation but this time used as a compliment to the music rather than as a focal point as it had been in previous albums. 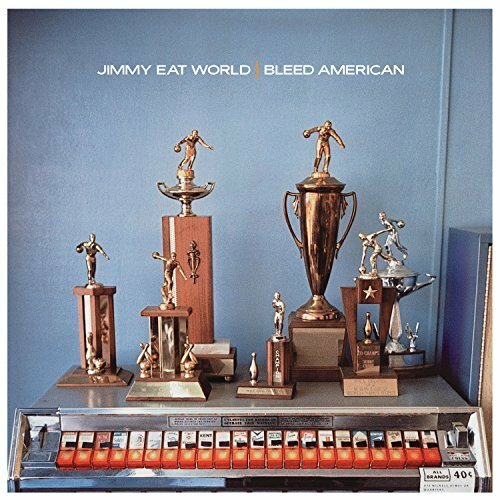 While the pop side got a bit away from their punk roots, the pop-punk revolution was just beginning in the U.S., and Jimmy Eat World is largely considered one of the pioneers of the genre. This came out at a time when I probably listened to even more music than I do now— which is saying something. While “The Middle” would have undoubtedly been the track that introduced me to both the album and the band, it certainly isn’t my favorite song of theirs. Generally speaking, the emo-pop/punk music isn’t necessarily tops on my playlist, but Jimmy Eat World does it in a way that isn’t as monotonous or disingenuous as bands that came out in the mid-2000s. You’ll often hear a Jimmy track at the ballpark or on the radio and it’s an instant throwback to 2001 and whatever you were doing in the moment. If you asked me about this style of music and which bands did it best, these guys would certainly be toward the top, if not number one. Jimmy Eat World is still touring and putting out new music consistently. While they’ve been unable to ever catch lightning in a bottle like they did with Bleed American, they still have a solid following and are releasing albums backed by RCA. Give this a listen today and see what the fuss is about. For mere pocket change, you won’t be disappointed. Free HBO and Cinemax preview weekend!